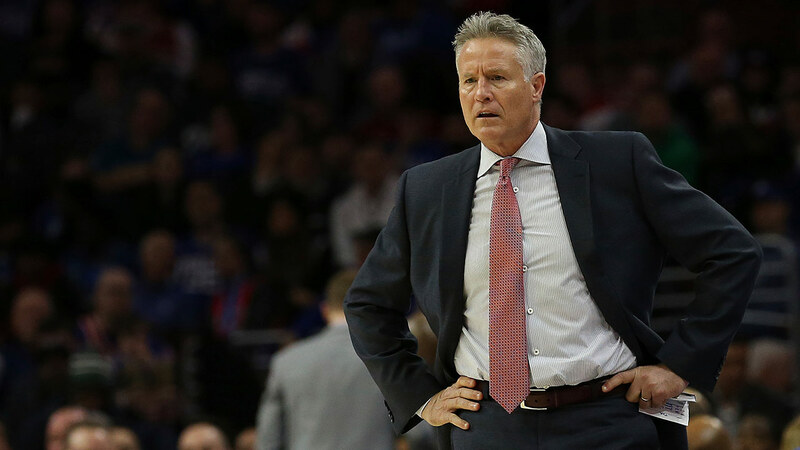 PHILADELPHIA (WPVI) -- The Philadelphia 76ers have announced a three-year contract extension for coach Brett Brown while team president Bryan Colangelo is embroiled in controversy. Brown, who took the 76ers from 10 wins to the third seed in the Eastern Conference in just two seasons, got a new deal Thursday that runs through the 2021-2022 season. On Wednesday, the team said it is investigating whether Colangelo used a variety of Twitter accounts to anonymously trash some of his own players and fellow executives and defend himself against criticism from fans and the sports media. "Brett has done a terrific job over the past several years building and cultivating a program, but the substantially positive growth in the win column these past two seasons has proven he is the right man to continue leading this team in our quest for an NBA championship," Colangelo said in a statement. "I couldn't be more thrilled for Brett, his family and the organization to be moving forward for several years to come." Brown had one year left on his contract. Philadelphia hasn't won an NBA title since Julius Erving and Moses Malone led the Sixers over the Los Angeles Lakers in 1983. Under Brown's watch, Joel Embiid and Ben Simmons have blossomed into two of the top young players in the league. Brown was hired as the Sixers were about to undergo their rebuilding process that became known as "The Process." The 76ers won 19, 18 and 10 games in each of Brown's first three seasons. The Sixers won 28 games in 2016-17 and made the playoffs this season for the first time since 2012. Even with two 26-game losing streaks on his resume, the front office has never wavered in its feeling that Brown is the right coach for the franchise. Brown is 127-283 (.310) with one winning record in five seasons.